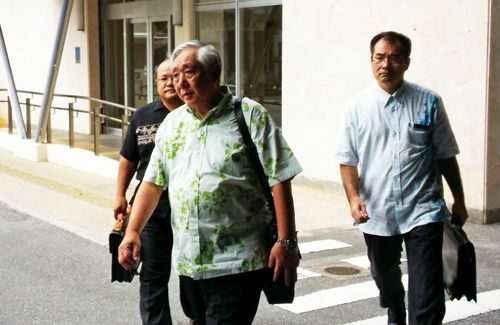 At 1:30 p.m. on September 23, the Okinawa prefectural government appealed a ruling by the Naha branch of the Fukuoka High Court that judged Governor Onaga’s cancellation of approval to reclaim land to be illegal. The ruling was the result of a lawsuit brought by the national government against Okinawa concerning Onaga’s cancellation of approval to reclaim land in Henoko, Nago, wherein the government claimed that it was illegal for Onaga to cancel the permit. If the Supreme Court accepts the appeal and a trial commences, a final verdict is expected to be reached by the end of this year. The deadline for the Okinawa prefectural government to submit a statement of grounds for appeal is October 3. If the Supreme Court sides with the Okinawa prefectural government, Okinawa will not be required to obey the “rectification order” issued by the government demanding that the approval be reinstated, and the cancellation will maintain its force. If Okinawa loses the case, the prefectural government will obey the rectification order and reinstate the approval. However, the Okinawa prefectural government maintains that even if Okinawa loses the case and the approval regains force, its stance of using “every available means” to prevent the Henoko base construction will not change, and the future of the base relocation issue remains unclear.